SPCA News & Events/ Poor Homeless Old Woman and Her Cat/ Who’s gonna help? 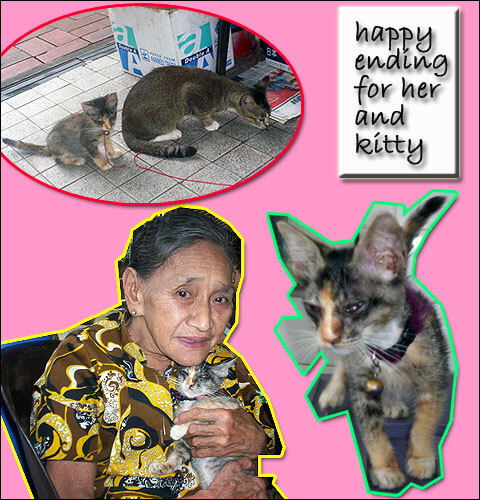 Don’t get me wrong, I’m happy and thankful that SPCA was able to help the poor old lady and the kitty. It’s the picture of the old lady hugging her kitty that almost had me in tears. Both of them look so fragile, yet the old lady loves her cat so much she brings it everywhere with her even though she has no home herself. Her love for her cat really touches me, but it makes me sad that she has no home of her own. Who’s going to help her?